When you are looking for a candle that is a little different, cool candle making ideas provide the inspiration to create something truly unique. The craft of candle making presents a great opportunity to create really unusual candles. A few key candle making materials are all that is required to create a whole range of candles from taper candles and prayer candles to making soy candle tarts. Making your own candles is a fantastic way to create designs that are customized to your own requirements. It is also the perfect opportunity to create funky and cool candles that are a little different than what might be found in a store. Making cool candles is simple to do. There are plenty of ways that even the most basic candle making recipe can be adapted to create one-of-a-kind candles. Traditionally, candles were left plain and undyed. Therefore, candles were a neutral color and a far cry from the wide range of colored candles that can be found today. 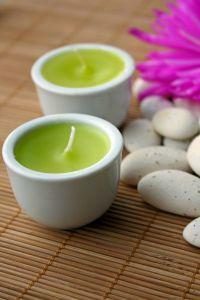 Funky colors such as lime green and shocking pink make great candles. It is simple to introduce color to a candle recipe and customize a candle to match a room décor or perhaps the color theme of a party. There are special candle dyes that are available, or it is even possible to use wax crayons. Candles can be created in single colors, or, for really cool effects, can be created in layers. This works particularly well in column candles. Scented candles are a lovely way to introduce fragrance into a room. Special candle fragrances are available in a wide range of scents from traditional fragrances such as rose, lavender or pine through to more unusual fragrances such as chocolate, banana or even freshly mowed grass. It is important to use specially designed candle fragrances as some other fragrance oils could catch alight when the candle is burning and become a hazard. There are a wide variety of molds available that are ideal for cool candle making. Shapes such as traditional squares and pillars are widely available from candle making suppliers, as well as more unusual and contemporary styles. Gothic and mystic designs can make unusual and dramatic candles. In addition to purpose made molds, candles can be formed in other household items. Plant pots, for instance, can make great container candles if there are no holes at the bottom. Small cake tins are ideal for making floating candles. Make tutti fruity style candles. Save up ends of candles and other pieces of colored candle wax. Put these into a mold and cover with hot wax. The different colored pieces of wax will shine through the candle and give an interesting and unusual effect. For a 'holey' candle, fill a candle mold with ice cubes. Pour hot wax over the ice cubes and the wax will set around the cubes. As the ice melts, the candle will have a number of holes. Have a go at candle carving. This is the ideal way to produce some really cool designs which will be truly one of a kind! Save any wax shavings to make the tutti fruity candle mentioned above.